Kurdish fighters gained an important victory against the Islamic State group Friday by seizing a key stronghold in Syria's northeastern Hasakeh province, the Syrian Observatory for Human Rights said. "The jihadists retreated without much resistance after Kurdish forces, backed by Arab fighters, returned to Tal Hamis" some 30 kilometres (18 miles) from Qamishli, the Britain-based monitor said. The Kurds now occupy a strip of land linking Tal Hamis with the Iraqi border, impeding militant movements in the region. The main Kurdish party, the Kurdish Democratic Union Party (PYD), said its fighters had liberated Tal Hamis and surrounding communities at the request of villagers "who wanted to get rid of these terrorists and mercenaries". IS militants withdrew to other parts of Hasakeh, and Arab villagers also fled the Kurdish advance towards the Turkish border, the Observatory said. 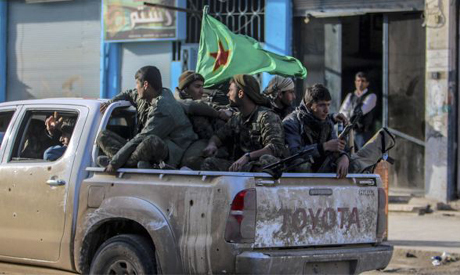 It said Kurdish forces have burned houses belonging to fighters and IS supporters. Earlier, the Observatory reported that fighters from the Kurdish People's Protection Units (YPG) had entered Tal Hamis and captured parts of it after six days of clashes with the militants. The town is northeast of the provincial capital, Hasakeh city, and has been under IS control for more than a year. Observatory director Rami Abdel Rahman said the town was "one of the most important strongholds" of the group in the region. The Kurdish advance comes after days of fighting in which YPG forces have taken some 103 villages and hamlets in the area. Since the clashes began on February 21, at least 175 IS fighters have been killed by the Kurds and air strikes by a the US-led coalition. Additionally, 30 fighters from the YPG and Arab rebel units fighting alongside them have been killed. Among the dead was an Australian, the first Westerner to die in a Kurdish unit in Syria. The Pentagon said the coalition had carried out several air strikes in Hasakeh province Thursday, including three near Hasakeh city and three near Tal Hamis. The fighting in Tal Hamis came as Kurdish forces continued to battle IS after an offensive elsewhere in the province, in which the jihadists have kidnapped at least 220 Assyrian Christians. The offensive, in which IS also seized 10 villages, has prompted a mass exodus of an estimated 5,000 residents to the cities of Qamishli and Hasakeh. Jean Tolo, an official with the Assyrian Organisation for Relief and Development in Qamishli said the pace of arrivals had slowed by Friday. "There are doctors working for free ready to deal with any emergency," he added, saying around 200 Assyrian families were sheltering in Qamishli with another 900 in Hasakeh city.